Tour opportunities are available Wednesday, September 3 through Friday, September 5, 2014. Visitors will ascend the Tower elevator to the observation level where they can take in spectacular views in all four directions. To take advantage of this unique experience, sign up for one of the available tour times. To reserve your free tickets please visit http://towertours2014.eventbrite.com. This event is free and open to the public, however, tickets are required. The Basilica offers ample free parking and is conveniently located within walking distance of the Brookland-CUA Station on Metro’s Red Line. For more information, please call the Basilica at 202-526-8300. Visit the website: www.hrccrichmond.org and click on the Bishop’s Cup Select Your Team Today and Join US! Commonwealth Catholic Food Pantry – in June you donated 172 bags of groceries that helped feed 894 needy neighbors and friends. Your response to our food shortage problem has been wonderful, you continue to respond to the call to help those less fortunate than ourselves. The need has not lessened as a dramatic increase of people coming to the food pantry is growing every week. Our next food drive will be the weekend of August 10th when volunteers and the Knights of Columbus will be handing out empty grocery bags after all masses. If you can, please add some extra cereal or peanut butter to your offering. And please do not pass our volunteers and Knights by. Take an empty grocery bag home and return it the next weekend. Thank you for your continued support of this important ministry. Suggest Website from Mike Kozak! Will Married Priest Solve the Vocations Problem? Married priests? I am one. As a former Anglican minister, I have been ordained as a Catholic priest under a special measure called the Pastoral Provision. Through this process a married man who has been ordained in the Anglican (and sometimes Lutheran and Methodist churches) is granted a dispensation from the vow of celibacy in order to be ordained as a Catholic priest. First of all there are some distinctions to be made. 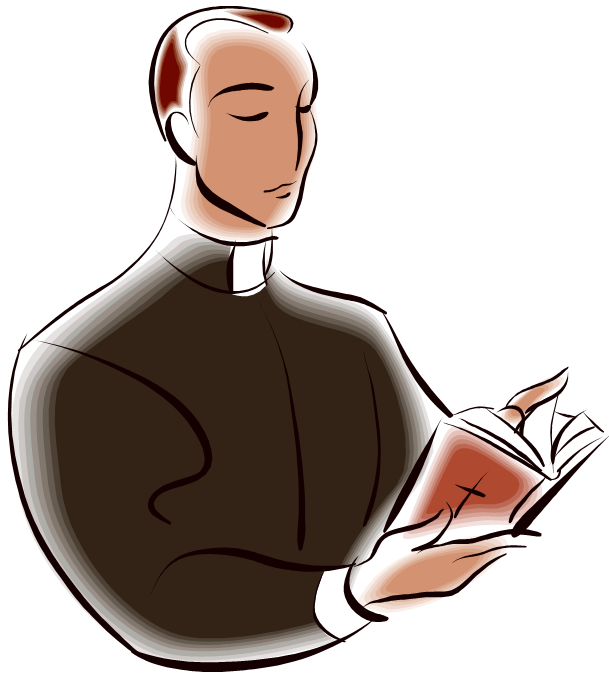 Celibacy for priests is a discipline of the church, not a doctrine. That is why exceptions can be made and the rule could be changed. However, if it is changed that doesn’t mean that priests can be married. The Church continues to uphold the fine and ancient tradition of priestly celibacy and a priest has taken a vow of celibacy which is life long and cannot be broken. That is to say men who are already married to only one woman (he forbids polygamy) may be considered worthy of ordination. It is the discipline of the Western Church that clerics are celibate, but it is a discipline which could be changed. Paul himself says in I Cor. 7.25 that his opinion that the unmarried remain so is not mandated from the Lord, and implies that it could be changed. Should it be changed? Should we allow married men to be ordained? First let me take this time to congratulate you on your election to office for your council. The fraternal year has begun and I am looking forward to working with you and your Council members who are ready to embark on new beginnings. Your dedication, leadership and brotherhood will truly enhance the 2014-2015 Fraternal Year. Please mark your calendars for the 2014-2015 Officer’s Installation Ceremony on Sunday, July 27, 2014 at 3:00 PM. The installation will be held at Holy Rosary Catholic Church: 3300 “R” Street, Richmond, Virginia 23223. I am looking forward to your participation and team work for 2014-2015. If you have any questions, do not hesitate to contact me. It highlights may aspects of our Catholic faith, as well as other interesting thoughts about being Catholic and opening up to others. It even touches on the special bond found through being in the Knights of Columbus. It also emphasizes the need for groups like the St Bridget Men’s Ministry of Faith and Fellowship. It’s a great read, I hope you enjoy it too! “I am a rock. I am an island.” These words from an old Simon and Garfunkel song sum up how I viewed the need for close friendships for most of my life. The stubbornness and pride that had led me to walk away from the Baptist Church as a teenager had manifested themselves as a formidable wall around my heart and a reflexive need to keep others at an emotional distance. I was self-sufficient and thought I had it all figured out as I was growing my career after college and focused on work and little else. Then I met my wife in my late twenties and the wall around my heart began to crumble as I started sharing my life with someone I loved. Although these were still my pre-Catholic years in the spiritual wilderness, I can look back and see my marriage and enduring love for my wife as the first steps in God’s efforts to bring me back to a relationship with Him. When each of my sons were born, the wall around my heart eroded further and continued steadily until the fall of 2005 when I experienced a profound conversion to Christ. I wrote extensively about my conversion to the Catholic Church in my second book Along the Way: Lessons for An Authentic Journey of Faith, and won’t devote much time to it here. What is important is to recognize that I came to the place when the wall around my heart was largely gone after years of the Holy Spirit and my unconditional love for my family working on me. I surrendered to Christ and stopped trying to compete with Him for control. I gave up everything to Him and received back everything I needed (not necessarily what I might have wanted). I went from saying no to God for over two decades to saying yes, and that has had an incredible impact on my life and family. So, what does this have to do with friendship? After I surrendered to Christ and began RCIA to enter the Catholic Church on the Feast of Christ the King in 2006, I began experiencing a need for friendship with other Catholic men and a desire to end my self-imposed lonely exile. I sought out husbands, fathers, and business people in my parish community who I could go to for help and, in turn, I could help as well. It took me surrendering to Christ and letting go of my emotionally walled-off old self to recognize how much I needed to have Catholic brothers in my life. My surrender came from a place of humility and the recognition that I was not self-sufficient. I needed people outside of my immediate family to help and encourage me on the journey in front of me. I also needed a group of friends to be brutally honest with me and help me stay on the right track. In 2007 I formed a group of Catholic businessmen [like our own St Expeditus, Richmond Catholic business networking group – http://www.saintexpeditusgroup.org/ ] with the help of Deacon Mike Bickerstaff. The goal was to gather together once a month with like-minded Catholic men from the Atlanta business community who wanted to more fully integrate their faith with their work. Many of those men are still in the group and we have added others over the years. We come together for prayer, a Gospel reflection, and talk through topics relevant to living out our faith at work and the public square. The group often does service projects together where we involve our families. We also have very candid conversations and open sharing built on trust and the knowledge that we will keep the conversations confidential and not judge each other. I value these conversations more than I can ever express with the written word. This group of men is my bedrock. I can count on them and they, in turn, can count on me. I get honesty, encouragement, support, and every now and then a well-deserved kick in the pants from these great men. These are my brothers in Christ and I am grateful for them. 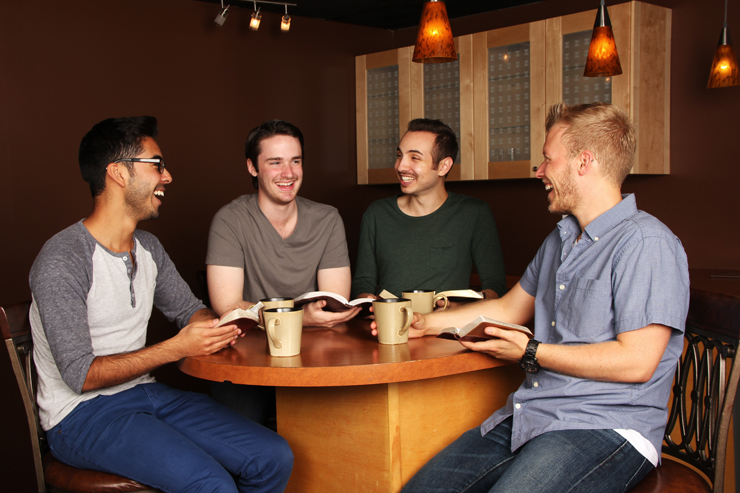 The Church, parishes, and many other organizations offer a number of good options for Catholic men seeking friendship and brotherhood. One such organization is the Knights of Columbus. I am an inactive Second Degree Knight, primarily because of the weeknight schedule with my sons and their various activities, but I love the mission of the Knights of Columbus and everything they stand for. Because of my admiration for the Knights, I reached out to Brian Caulfield to get his thoughts on the importance of friendship and brotherhood for Catholic men. Brian is the editor of the website FathersforGood.org, sponsored by the Knights of Columbus Supreme Council, and is a communications specialist in the Office of the Supreme Knight in New Haven, Connecticut. Since December 2011 he also has served as Vice Postulator of the Cause for Canonization of Father Michael McGivney, the founder of the Knights of Columbus who holds the title of Venerable. Brian served as editor of the book Man to Man, Dad to Dad: Catholic Faith and Fatherhood (Pauline, 2013). Brian, I have long appreciated the wonderful ministry work you do for Catholic men through your work with the Knights of Columbus and your FathersforGood.org website. I am curious to capture your thoughts on the need for fellowship and encouragement among Catholic men. Why is this so important? “Men face a number of challenges in today’s culture but the most basic involve questions about the very nature of manhood and masculinity. For decades, men, in particular fathers, have been portrayed in popular media as clueless and often dangerous. In television and movies, if Dad isn’t being led around by his wise wife and hoodwinked by his wise-guy children, then it’s likely that he’s a macho philanderer or even an abuser. I generalize, of course, but there is a definite trend in this direction. “Add to this the fact that over the same decades there has been an increase of broken homes and children losing contact with their divorced father, and you have a crisis of manhood and fatherhood. What are the obstacles keeping Catholic men from relying on each other for support and help in excelling in our faith, at home, and at work? For the shy or nervous Catholic man interested in connecting with other Catholic brothers in his parish or local community but is not sure how to do it, what would be your advice? Can you share an example from your own life or the life of someone you know where the impact of Catholic brotherhood made a significant difference? Friendship, brotherhood, fellowship, male bonding, accountability, prayer, spiritual growth, service, these are the words which come to mind when I think of how important it is for me to have other Catholic men in my life. How about you? So many other men I know and respect are much better at this idea of Catholic brotherhood than me, and I am grateful for their example. But other men I have observed struggle with this concept. They do not participate in parish-based events or meetings or join the men-focused groups available to them. In fact, they are rarely seen outside of weekly Mass. Why? A few men shared that they didn’t feel welcomed by the groups. This is a legitimate concern. For those of us already in groups or organizations, we have an absolute obligation to make everyone feel welcomed, no question. Some men are simply shy and introverted. Fair enough. Maybe the way to take the first steps is to volunteer for a service project within the parish. As Brian Caulfield shared, showing up and helping out can gain fast acceptance from other men. You don’t have to be the life of the party to participate, just work on being comfortable around your Catholic brothers. “I am busy and don’t have time.” I hear this a lot. Everyone has a different situation, but ask yourself if you are missing something in your life. Do you ever have a desire to speak to other men who have similar backgrounds and experiences? Are we using our families as an excuse? I am guilty of this at times, but I try to bring my sons to service projects whenever possible and this has been a good compromise. “My evenings are for family.” Great, so are mine. We all understand, especially if our kids are under the age of eighteen. Why not focus on breakfast or lunch meetings? There are plenty of Catholic men’s Bible studies and prayer groups which meet during these times. At the very least, make an attempt to meet other parishioners and get together one on one. Just make the effort and the payoff will be tremendous. The biggest objection I heard was, “I don’t see the point.” If this is your take on the idea of Catholic brotherhood, let me push back a little. Is your faith life where you want it to be? How is your prayer life? Are you still growing as a Catholic man and, if so, who are your role models? Wouldn’t it be a relief to be able to discuss your challenges and struggles with other men who get it and can offer sound advice? Do you have all of the encouragement and prayers you could ever want? Are your current relationships aiding you—or hindering you—on your journey to holiness and relationship with Jesus? I think you get the point. Men need other men. Iron sharpens iron, and one man sharpens another (Proverbs 27:17). What if Jesus came into the world and never chose the Apostles? Who would have carried on in evangelizing the world after the Ascension? Who would have recruited other men to take their places? We are called to be holy, we are called to evangelize, and we are made for heaven. The journey will be much more enjoyable and fruitful in the company of our brothers. Editor’s Note: Be sure to check out Randy Hain’s fifth and newest book, Journey to Heaven: A Road Map for Catholic Men (Emmaus Road Publishing). The book is available through Amazon.com, EmmausRoad.org, Barnes&Noble or found in your local Catholic bookstore. Per below, read from a notice from our new District 9 Deputy Tom Duck that our Council has been transferred from District 27 to District 9. This means we will be with 4 other Western Henrico councils which includes St Mary’s, St Michaels and Council 395 at the Columbian Center . Sam Patterson will continue as District Deputy for District 27 . So… our Installations Of Officers Date and Time Changes from Holy Rosary Church on Sunday July 27th to St Michaels Parish on Sunday July 20th arriving at 2:30PM. Officers please plan to attend and contact me to confirm you will attend. At this time we are planning for the installation of officers to be on the 20th of July at St. Michaels Parish. The installation will start at 3:00 pm and all should arrive at 2:30 to prepare and set up for the installation. This event should be coordinated by all Grand Knights and if this conflicts with anyone’s schedule or you desire a separate installation, please let me know as soon as possible. I am hoping we will have a social afterwards and that all councils will work together to make it a successful social and installation. Thanks for all you do and please respond as soon as you can with your acceptance of this date and time. Washington D.C., Jun 26, 2014 / 08:34 am (CNA/EWTN News).- The U.S. Supreme Court unanimously struck down a Massachusetts state law that imposed a 35-foot buffer zone around abortion clinics, in which protestors and pro-life counselors could not enter to speak with patients. The law violates First Amendment free speech protections, the court said in its McCullen vs. Coakley opinion, delivered June 26 by Chief Justice John Roberts, Jr. Although it did not strike down all buffer laws, the court said that the Massachusetts regulation is unconstitutional, stressing that sidewalks and public ways are key forums for free speech. In 2007, Massachusetts amended existing law and made it a crime to “knowingly stand on a ‘public way or sidewalk’ within 35 feet of an entrance or driveway to any ‘reproductive health care facility.’” This barred pro-life sidewalk counselors from distributing literature and having personal conversations with women entering the building anywhere within this distance of the clinic. However, pro-life challengers to the law said that it infringed upon their constitutionally-protected First Amendment right to the freedom of speech. They argued in a legal brief that the law “indiscriminately criminalizes even peaceful, consensual, non-obstructive conversation and leafleting” and that it unfairly targeted certain kinds of speech, namely, pro-life counseling and views. However, the Supreme Court overturned the appellate court’s ruling in a rare unanimous vote, saying that the law restricted speech on public streets and sidewalks. The buffer zone law imposed “serious burdens” on the free speech of pro-life sidewalk counselors, inhibiting their ability to conduct “close, personal conversations that they view as essential to ‘sidewalk counseling,’” as well as their ability to distribute literature, the court said.